Sending unauthorized SQL, LDAP, OS, or other commands to a receiving system through commands tied to websites (usually, as part of a URL) is this year's No. 1 security risk, just as it was in 2013. While the concept is simple, seeing injection in action can make it clear just how powerful an attack vector a browser's address bar can be. In many cases, injection works because an attacker sends a URL that should return an error, or null response, but instead is interpreted by the application and returns unauthorized data. A well-written and thoroughly vetted Web application will refuse to interpret these illicit instructions, but legacy code or quickly written applications can pass instructions to the back-end server and valuable information to the attacker. Understanding how code injection works — and what specific attacks look like — can help security professionals and developers alike better protect against the threat. 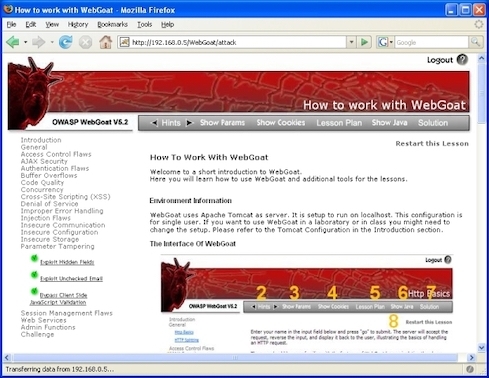 It's the first lesson many people learn from WebGoat — and it remains a valuable study for everyone.